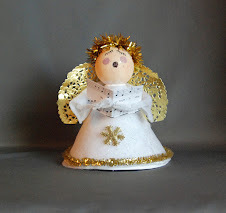 This is a Halloween version of my Folk Art Angel. 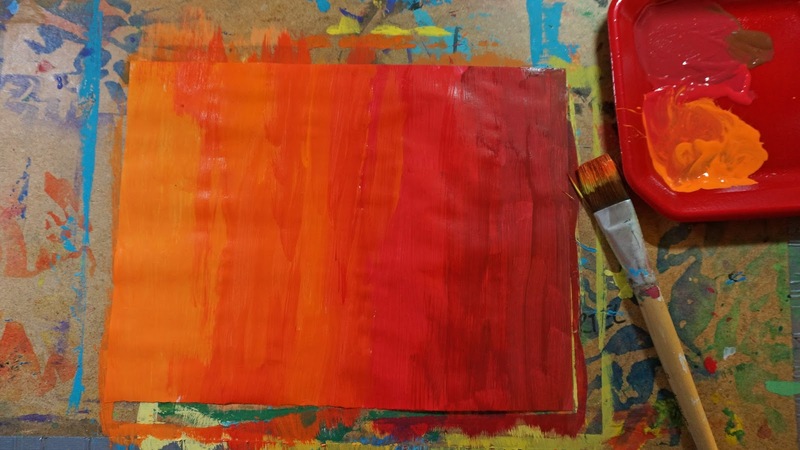 I taped my background paper to my art board. 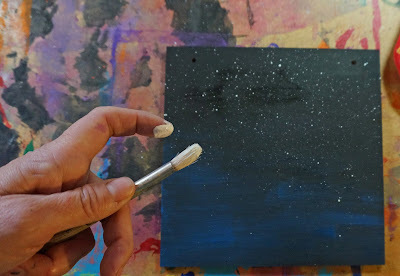 Using disk tempera paint I painted a night sky using blue and black. 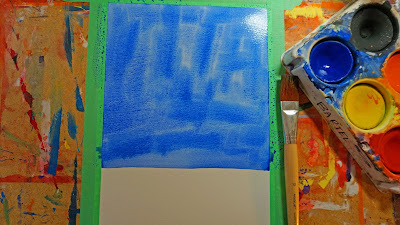 When background is dry take white acrylic or liquid tempera and mix in a little water. 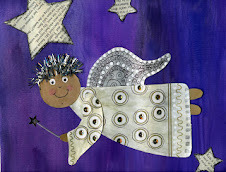 Using an old stiff brush dip in paint and then flick finger over the bristles to create star splatter. At school I like to do this in a box to cut down on the mess. Paint some paper with purple and orange tempera. We will use these papers to create the witch body and head. I decided I wanted a pattern on the dress so using some purple acrylic, the end of a pencil and the cap from a spray bottle I stamped on the pattern. 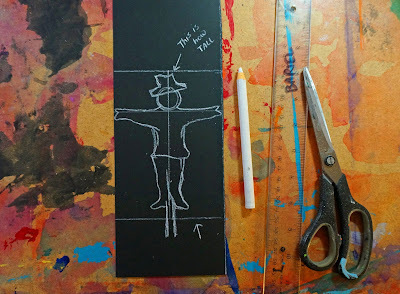 To make the paper for the hat and the legs I first used oil pastel. White stars for the hat and black lines for the legs. 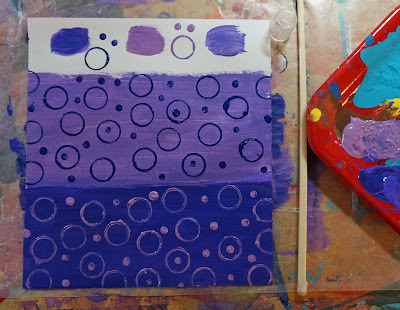 I then painted over them with disk tempera. 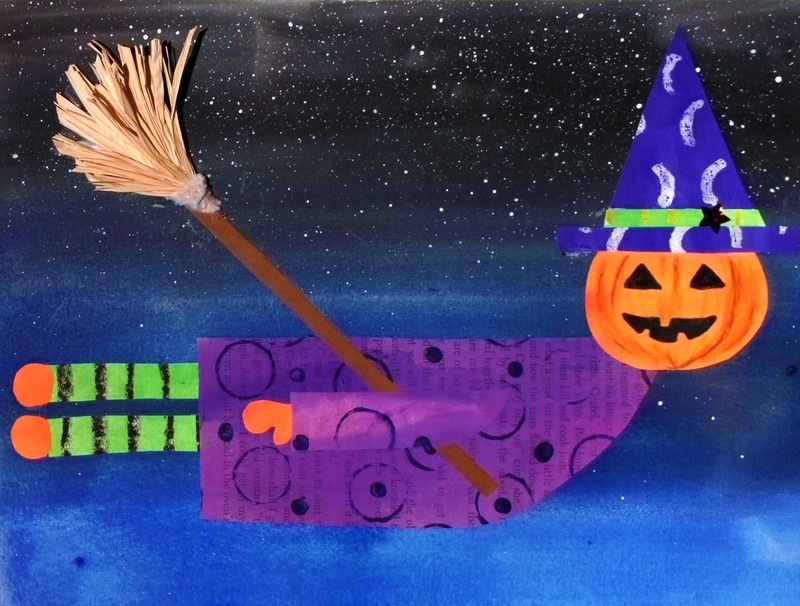 When the papers are dry I start to put my witch together. 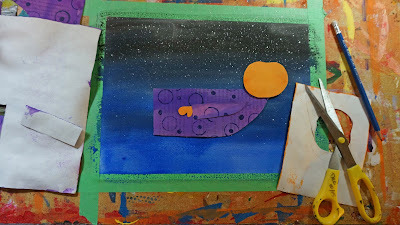 The body starts as a rectangle, I then cut one of the corners off. The arm is a skinny rectangle with a corner cut off. The head is a pumpkin shape. The legs are just 2 strips. I also cut out a witch hat. 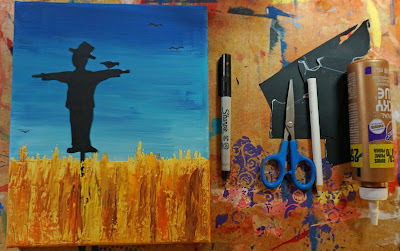 With the scraps of orange paper I cut 2 feet and a hand. 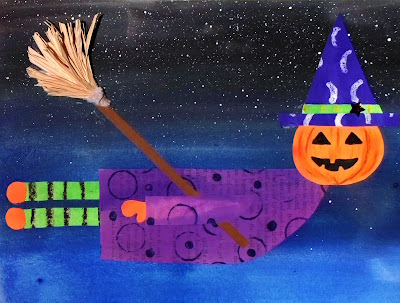 The broom is made from a strip of brown paper for the handle. 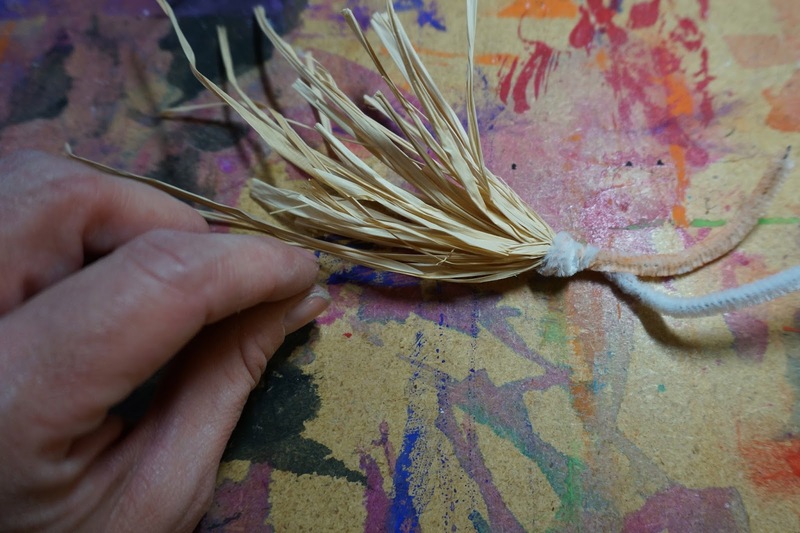 I wrap a pipe cleaner around the middle of some raffia. I fold it and then twist the pipe cleaner around the top. Finally with some pencil crayons and sharpie I add the details to the face. I added a strip to the hat and a star sticker. That's it, my Folk Art witch. 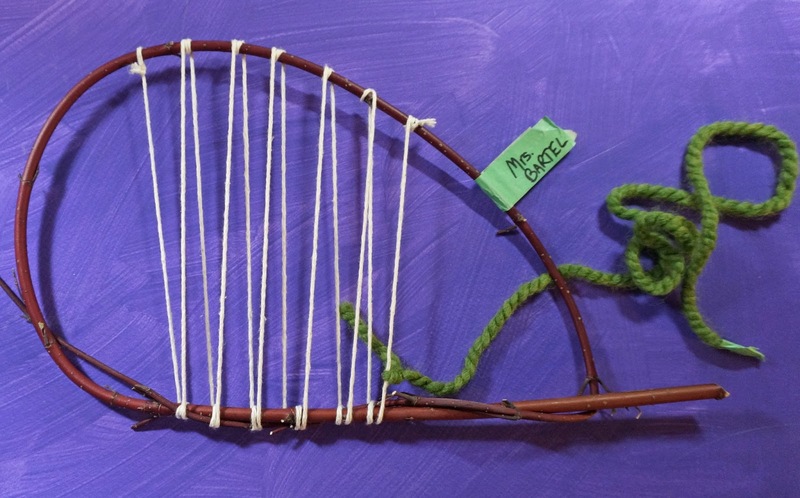 Last week I taught Grade 1 weaving at Altadore School. We started with a simple paper weaving to get them accustomed to the process. 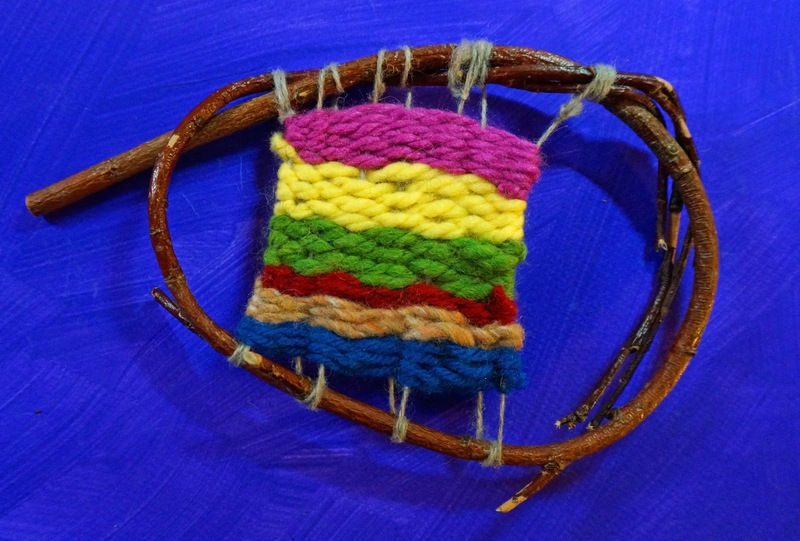 We then did a weaving on a branch loom. 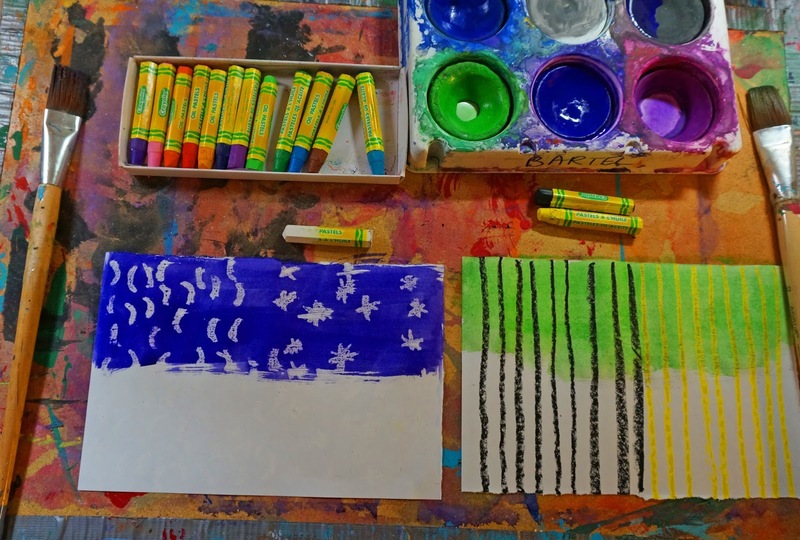 The students selected their favorite season and had to come up with colours for that season ahead of time in their 'wonder journals'. Don't you just love that title.... maybe my design journal should become my wonder journal! Each child did an illustration of that season using those colours. It was amazing how the process of weaving a textile feeds into the weaving of reflection or memories which then will result in a story. As each child changed to a new colour both myself and their teacher would ask them "What does this colour represent in your chosen season?". The answers were very expressive, "The yellow lights on my Christmas tree." or "The red watermelon of summer". Now that their weavings are done they are working on their writing projects. 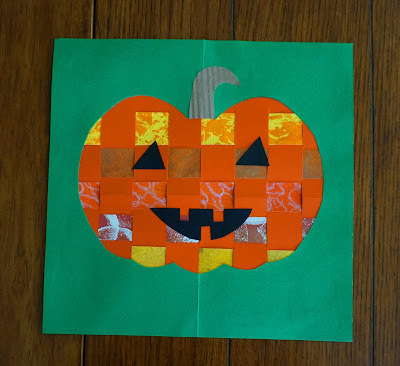 Now the Pumpkin paper weaving is based on this post from Cutting Tiny Bites. I just made a few changes. 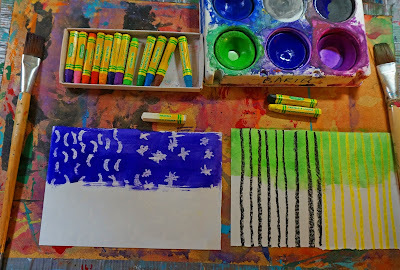 Instead of scrapbooking paper we used painted paper. 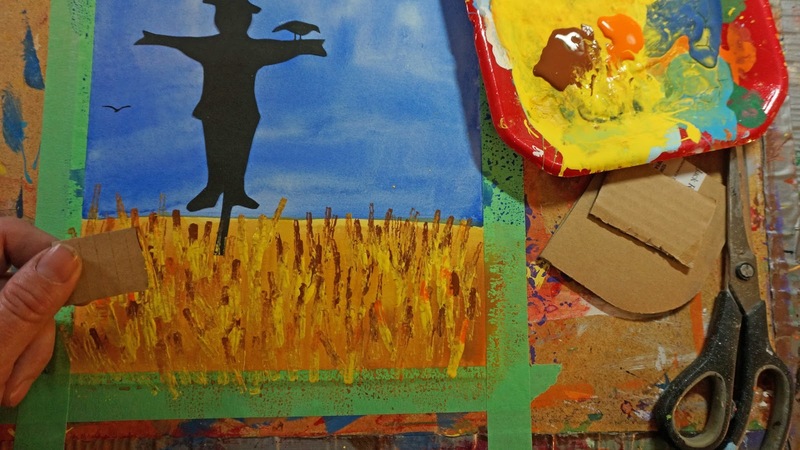 If every child paints on piece of paper you'll have lots. 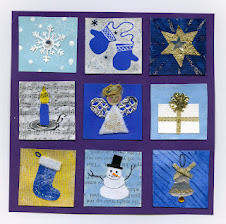 Each one was different using stamps, glitter, different printmaking techniques, variations in yellows and orange, etc. 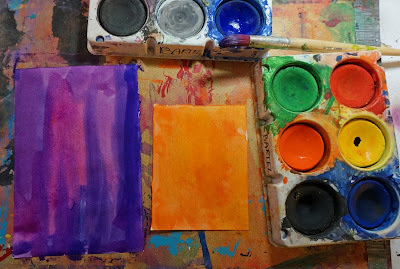 I gave each child a piece of orange cardstock for the loom. They folded it in half, corners to corners. Taking their ruler placed at the open end they drew a line across. It was the width of the ruler. This is the STOP line. Using the width of the ruler again they made vertical lines, about 7 or 8, depends on the size of your paper. They cut from the fold along these vertical lines until they reached the STOP line. 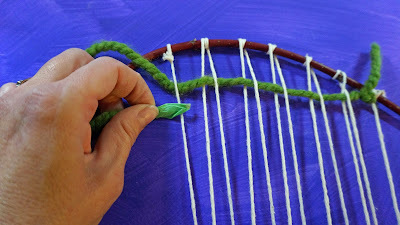 I demonstrated weaving on a giant piece of paper and then they started their own. We talked about the pattern and how it should look like a checkerboard as each new strip is opposite to the one before. You end up with something like this. 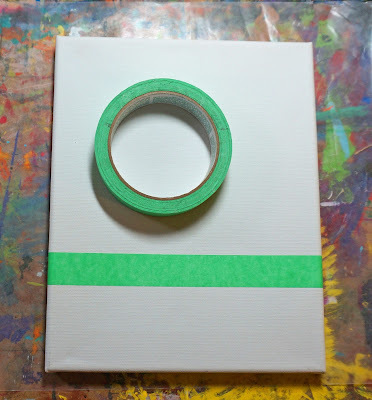 Now fold a green piece of paper in half. 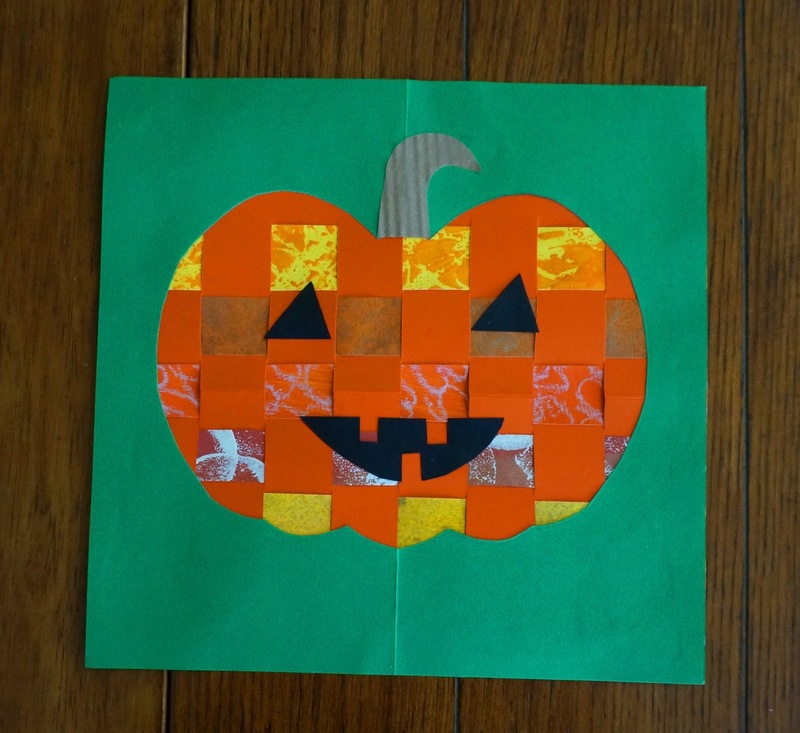 Using templates trace the half pumpkin shape on the fold. 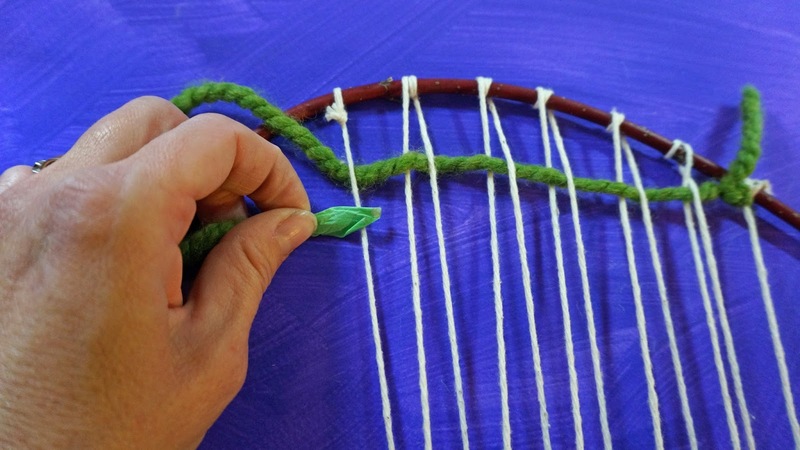 Using glue stick or white glue, glue the green sheet in place over the weaving. You can then trim the excess if needed. 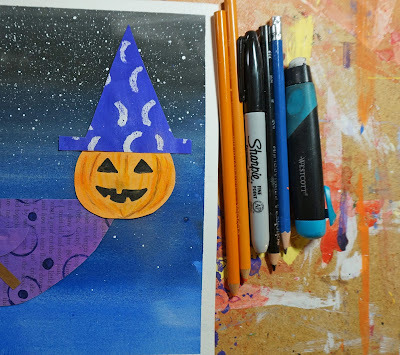 Using black paper scraps make your face and add a stem to the top. I collected all the branch looms before the project. I find Red Dogwood branches to be the best. I trim a branch and then loop into a circle right away. 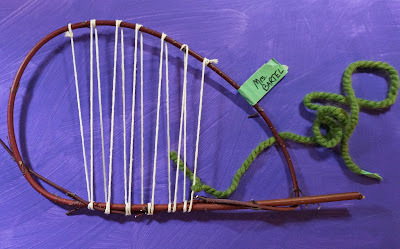 I tend to only do this project in the Fall when I'm trimming out branches and they are still pliable. Let them sit for a few days before weaving. 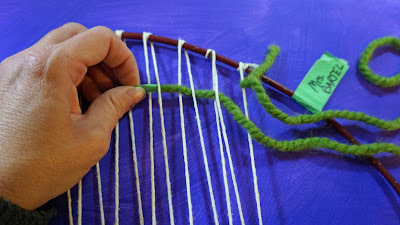 I made this little video to show you how to string the loom. I did this ahead of time before we started this project. I just use regular household string. 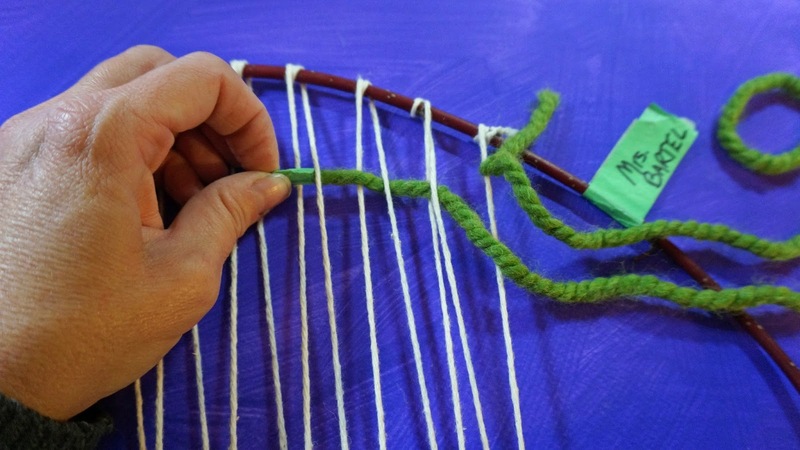 With the masking tape put each child's name on their loom. They select their first colour and you tie on about a 30 inch piece of yarn to the first string. With the masking tape put some tape on the other end to stop the yarn from unraveling as they are weaving. They begin using the same pattern as the paper weaving...under, over, under, over. 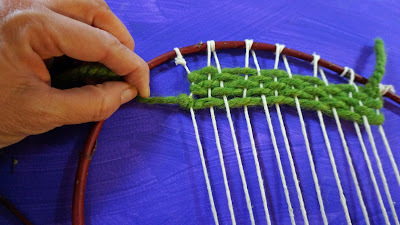 The biggest difference between yarn weaving and paper weaving is when we get to the end of a row we turn around and continue back. They had to do at least 5 rows before they could switch to another colour. I like to knot it off and then tie on another colour. That way my rows are just one colour and not 1/2 and 1/2. Here is some of the student work in process. A few weeks ago I was at the cabin and I attended the Annual Scarecrow Festival. 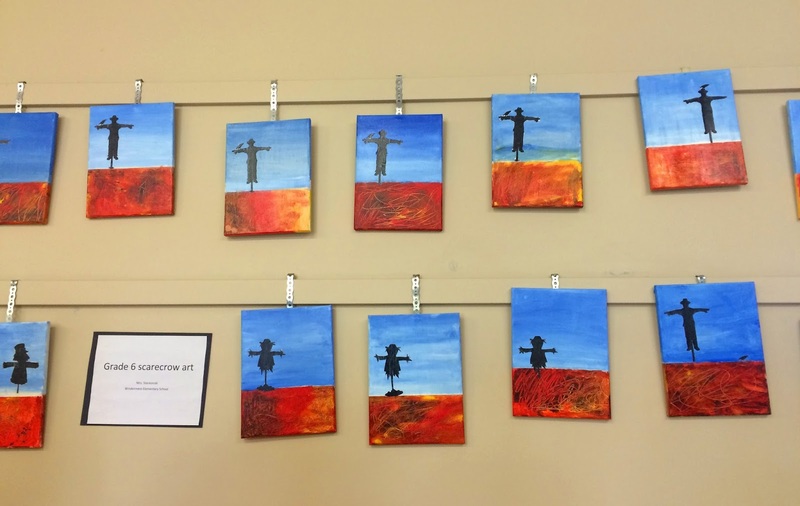 The was some amazing artwork by the students of Windermere Elementary School. I was quite taken by the work of Mrs. Stankovski's Grade 6 class. 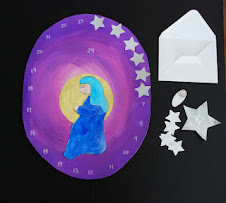 They were nice enough to let me feature this project on the blog for you. Now I have a canvas version and a paper version. 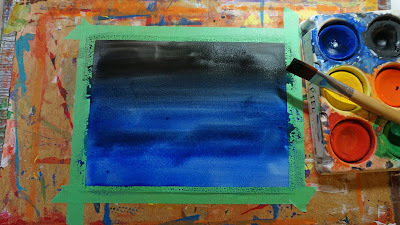 Before painting tape off the horizon line. This gives students a visual of where to stop painting and we want a nice straight horizon. 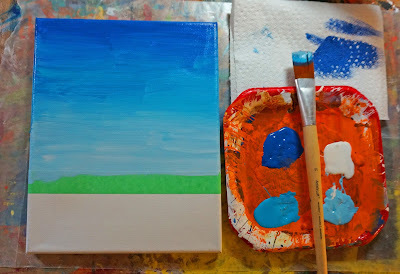 Using blue paint and a little white paint in your sky. Skies tend to be darkest at the zenith (top) and as the come down to the horizon get a bit lighter. Don't forget to wrap your colour around the sides and top. Put some drywall medium on a paper plate. 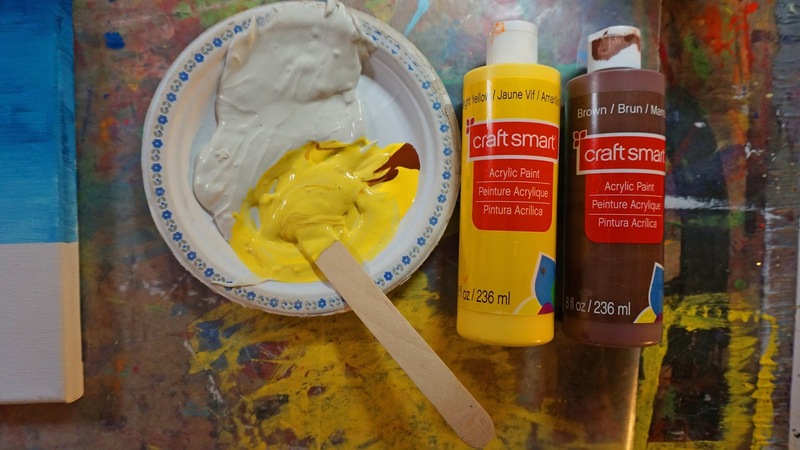 Mix in a little yellow and brown to colour the drywall. Using a Popsicle stick spread the drywall on the bottom of the canvas. Let the drywall set up for a few minutes. Using the edge of the Popsicle stick make lines in the drywall to give texture to your wheat. 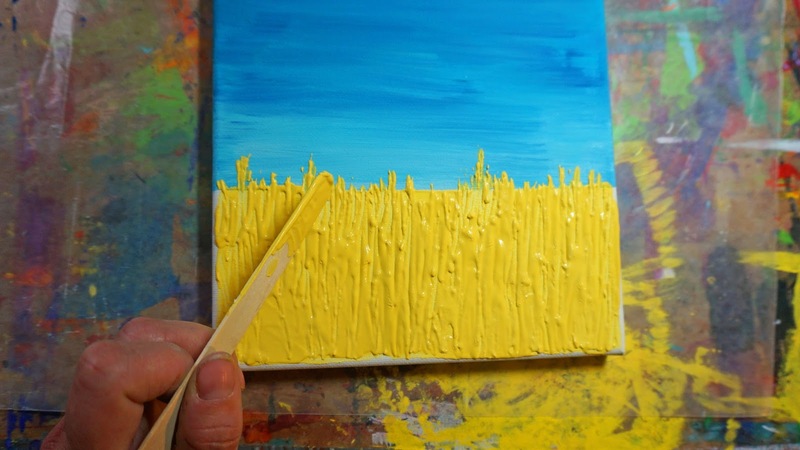 When dry add a little paint to highlight the texture. I used yellow, brown and some orange. 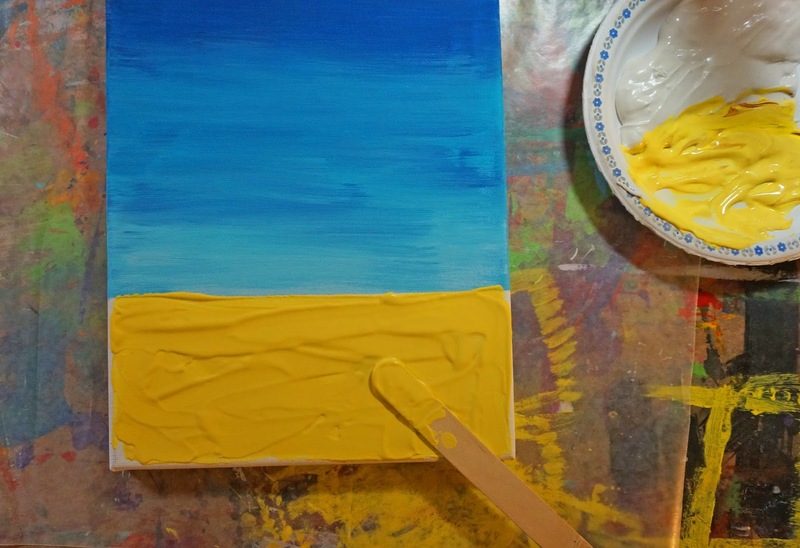 Use the paint to wrap this colour around the sides and the bottom. 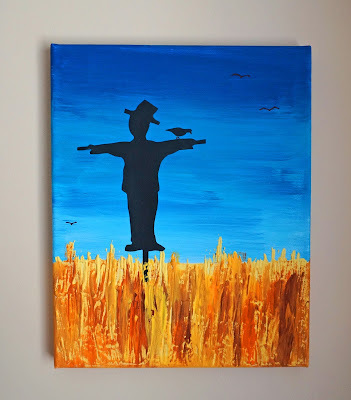 Time to add our scarecrow. I hold the black paper up to the canvas and measure how big I want it to be. Using a white pencil crayon or china marker I mark this. Draw a line down the center and one horizontal about 1 inch from my top line. 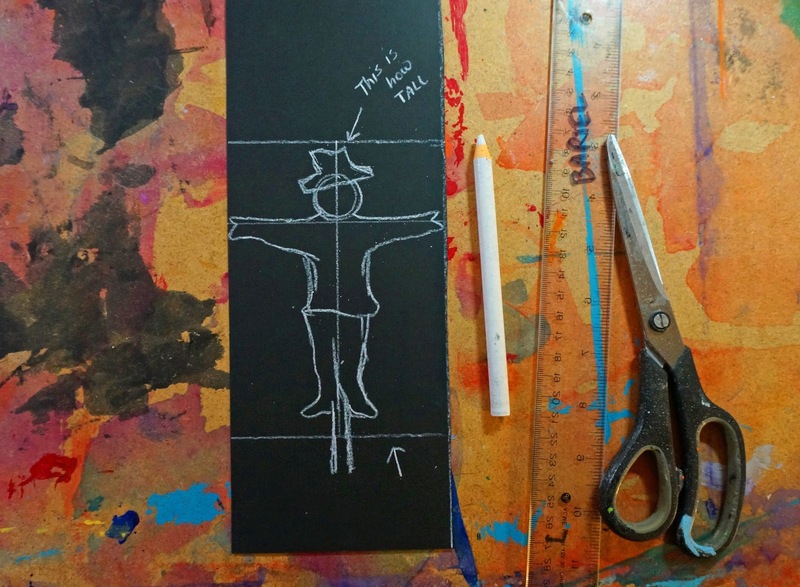 Draw out your scarecrow and then cut it out, include a bit of the pole at the bottom. Glue the scarecrow in place. 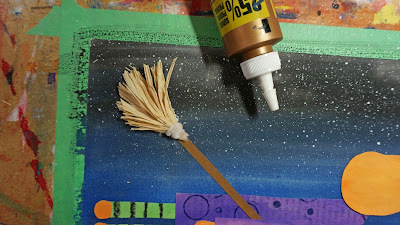 Put the glue on the side where you made your sketch. You can add a crow with paper, cut a bird shape, glue in place and use sharpie to add legs and beak. 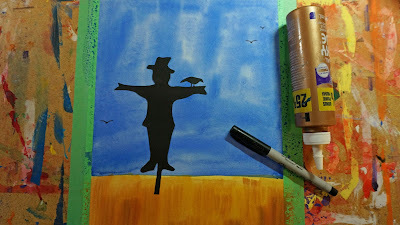 I also used the sharpie to add a few crows in the sky. You can also just use clip art like the Grade 6 class did. 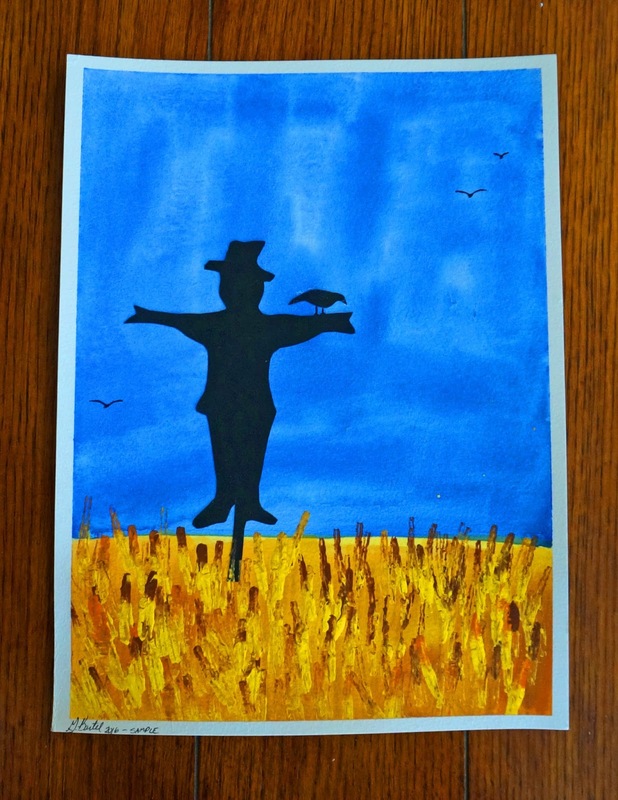 Another variation would be to draw the scarecrow in colour instead of a silhouette. Tape the edges of the paper for a nice white frame. Draw your horizon line in pencil and paint in the sky using blue disk tempera. 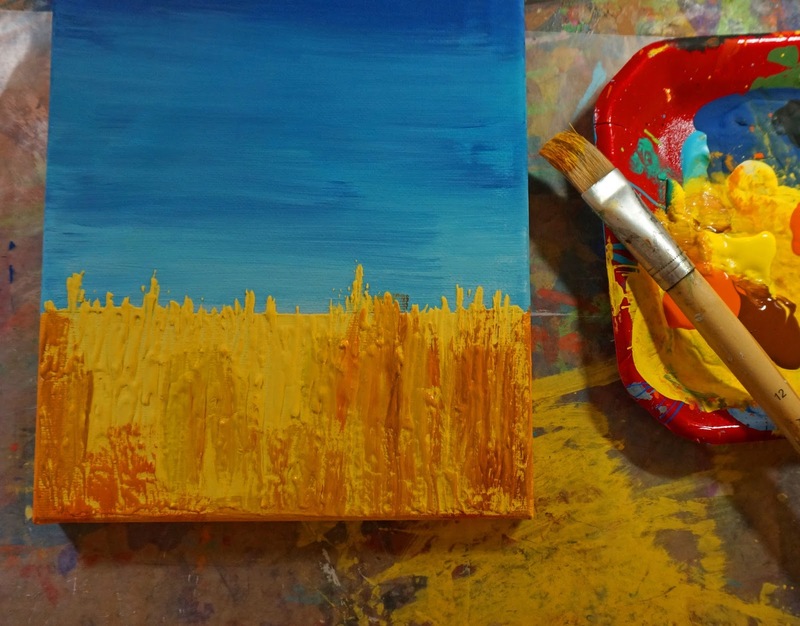 Paint in the wheat using yellow and brown. 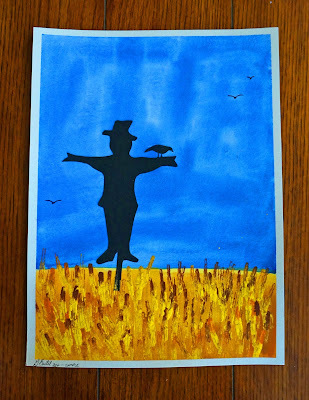 Make your scarecrow as described in the canvas version and glue to paper. As a last step to add some texture to your wheat use the edge of a piece of corrugated cardboard dipped in liquid tempera (or acrylic) and stamp on some wheat lines. 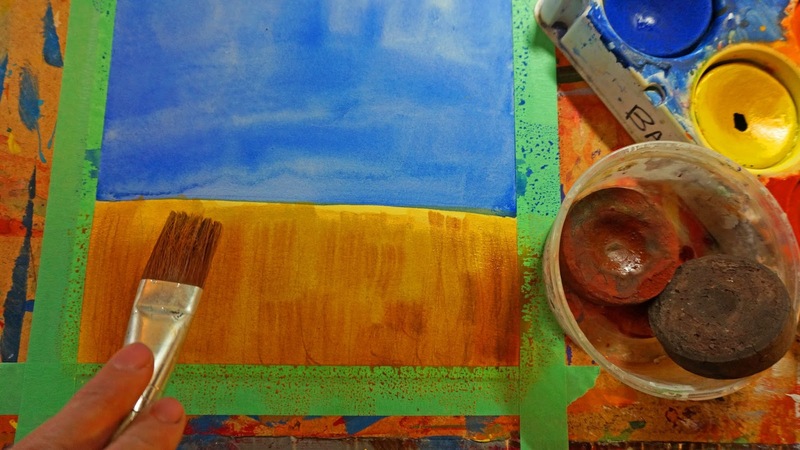 I used yellow, orange and brown. When paint has dried remove tape. That's it. I hope you give this project a try.